The Palais des Congrès is located at the Place-d’Armes metro station, less than a ten-minute walk from Gare Centrale of Montréal, the main train station in the city. If you want to travel by plane, choose Montréal-Trudeau Airport. It is located in Dorval, about 30 minutes away from the Palais des Congrès. You can find more information on transportation from the airport here. To get around in Montréal during your stay, we recommend renting a BIXI public bike or using the public transit network. The Palais des Congrès is located in downtown Montréal and is surrounded by numerous conveniently located hotels. Preferential rates have been negotiated for the participants of the ICLEI World Congress 2018. All the hotels are located within a 5 to 20 minutes walk from the Palais des Congrès de Montréal. The hotels are also in close proximity to many restaurants, museums, local attractions and nightlife. The Montreal metro system is an efficient and fast way to get around the city. 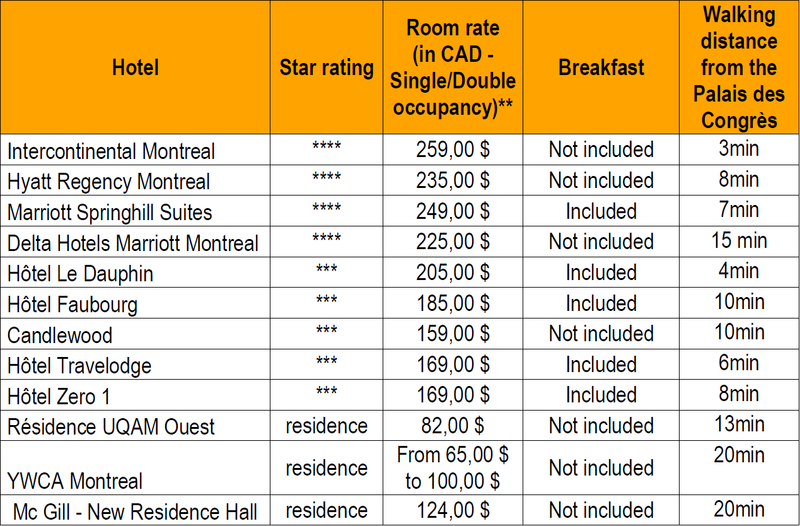 A selection of rooms in the following hotels will be available at preferential rates for Congress participants.